As depicted in the line chart below, this tool is designed to identify any weakness in the generation of free cash flow from operations. The increase in the uses of cash or the decline in the sources of cash are associated with a poorly functioning cash conversion cycle. Problems contributing to this weakness include the build-up of inventory and/or receivables, the decline in income or decrease in accounts payable balance among other factors. While an increase in sales can result in an increase in both inventory and receivables, issues arise when inventory turnover does not match sales growth and customers start delaying payments. A decrease in income or paying suppliers sooner than necessary are also contributors to a decline in cash flow. The line labeled Cash Throw-off shows a significant decline, starting at the end of year 3, in cash flow from operations. 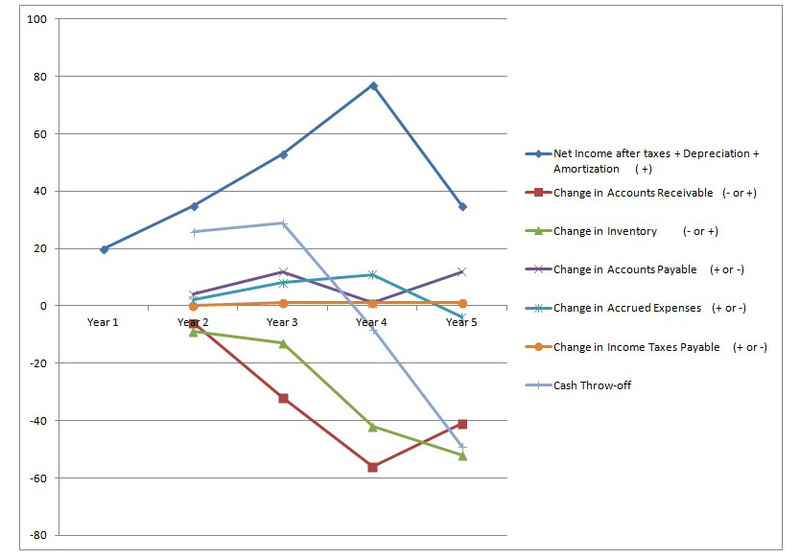 The values shown in the line chart are from an actual company’s Balance Sheet and Income Statement for a continuous 5 year period (not an ACG client and the company’s identity and actual figures have been masked). The diagnostic tool illustrates the company’s declining cash flow trend and its severe cash short fall in year 4 and beyond. The downturn in cash flow should have been spotted in year three with the flattening of cash generation cycle. The factors that contributed to this company’s situation which should have been addressed included collection problems, need for better credit risk assessment procedures, product quality issues, declining profit margins, excessive inventory, decline in sales and issues with short term cash forecasting. Had ACG been engaged by this client, we could have helped to solve these issues before the situation became grave for the company. ACG also uses other diagnostic tools and analyses to identify the root causes of these types of problems. Managing cash is critical to the functioning of any business, even more so in a declining sales environment. A company can make mistakes (fewer these days) but not having cash when needed is a short path to bankruptcy.